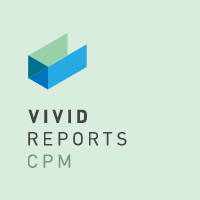 Vivid Reports CPM solutions provides a sophisticated reporting framework that delivers unprecedented processing speed, ease of use and security. It transforms Microsoft Excel into a secure presentation and analysis workspace, powered by a lightning fast SQL Server reporting engine. Vivid Reports CPM software enables finance departments and business professionals to quickly produce, deliver and analyze powerful and interactive financial reports and budget models. Our software empowers team members and stakeholders to immediately access the financial information and Key Performance Indicators (KPIs) they need to gain valuable insight, ensure targets are met and achieve maximum financial performance. In today’s competitive business environment, it’s vital that you have a window into your information. You need to have the tools to make sound business decisions and to meet new challenges and opportunities with confidence. Vivid Reports CPM is a comprehensive financial reporting, budgeting, and analysis CPM software solution that opens that window into your financial information. It provides your decision makers with the tools they need to easily view and analyze the financial performance of your organization without requiring them to have any technical expertise. Vivid Reports CPM solutions will increase the productivity of your organization, create efficiency of reporting processes and enable better decisions.